Seven are ‘pro-community’- that is, advocating things like bike trails and better broadband that almost everyone supports but are low on government priorities. Four are ‘pro-development’: one attacking conservation, one calling for the widening of all roads, another for the improvement of roads to all villages and another insisting on a highway from Mui Wo to the Lantau north coast (a costly idea rejected by the Highways Dept). These are supported by the rural committees and the development faction. One is a bit of both – parking in Mui Wo, which has a shortage of parking space, but with local population about to escalate the need for an expansion in public transport services is even more important. Support Lantau Development: We strongly demand an increase in the number of Mui Wo parking spaces. 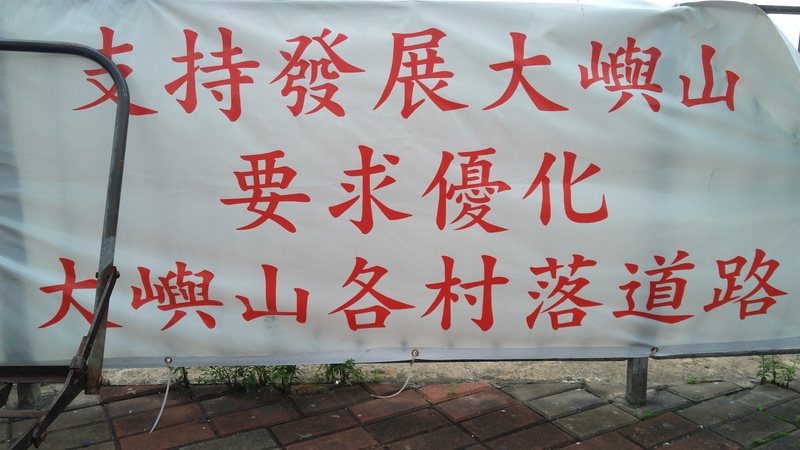 Support Lantau Development: We demand the improvement of roads to every Lantau village.